(PHOTO: akumalbayinfo.com) Akumal Bay is one of the main priorities for the new PROFEPA office. 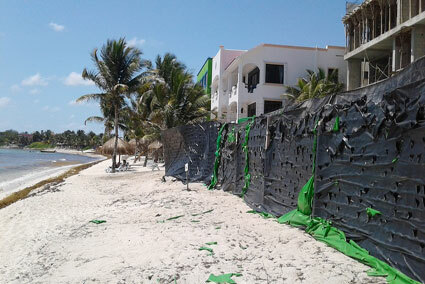 AKUMAL, Q. Roo — Several native species of flora on a dune ecosystem were devastated by a construction company that has built a four-story building in Media Luna Bay. Even though Akumal has a regional Federal Attorney General’s Office for Environmental Protection (Profepa), which was inaugurated last year, none of its inspectors has gone to close the building. Although vegetation, specifically speaking of coastal dunes, is of utmost importance to mitigate the effects of climate change and represents an important nesting area for two endangered species of sea turtles, this construction is still underway. 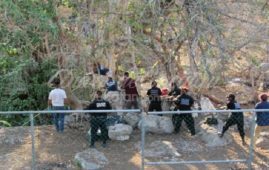 So far no federal environmental authority has taken any action in the matter. The property is located in north Akumal, on the beach known as Media Luna, between the Playa Blanca hotel and the Playa Caribe hotel condominium. The photos show the disappearing of coastal dunes and vegetation, and an area where every year turtles arrive to spawn, leaving the area as a desert with a concrete building that made endemic vegetation disappear. In addition, visitors conduct snorkel tours on the beach known as Media Luna, ignoring the momentary suspension of activities such as viewing sea turtles. Neither the inspectors of Profepa nor the authorities have made a statement regarding these facts.